This Return and Warranty Policy Statement (“Policy”) applies to all UTC Fire & Security Products (“Product(s)”) purchased directly from UTC Fire & Security in EMEA. If you have purchased UTC Fire & Security Products through a distributor or reseller, please return the Products to such party. UTC Fire & Security can, at any time and at sole discretion, amend this Policy from time to time. Please contact your local UTC sales office or UTC regional customer service for the latest available version of the Policy. Before you return any Product to UTC Fire & Security, you must obtain a return material authorization (RMA). Products returned without an RMA number cannot be processed and will be returned to you at your expense. This applies to all Products, including warranty repairs, out of warranty repairs, and stock returns. Before you request a repair RMA, firstly check if a firmware upgrade is available for your Product or contact your local UTC customer service for assistance. All Products must be returned freight prepaid DAP Weert within 30 days of obtaining an RMA. UTC Fire & Security will not accept unauthorized returns or freight collection returns and will return these to you at your expense. UTC Fire & Security will return repaired or replaced Products via its standard shipping method at no additional charge, any other shipping methods as may be requested by the purchaser will be charged at full cost. Any and all possible customs’ related formalities, customs levies, duties or any nature whatsoever shall be borne by the purchaser. UTC Fire & Security does not accept any cost which would result from the purchaser’s acts or omissions related to wrong, incomplete or inefficient formalities in connection with the import / export of the Products. Protecting the value of returned Products by packaging and shipping them correctly is your responsibility. UTC Fire & Security reserve the right to deny warranty coverage for any damage to Products caused by failing to meet the following packaging requirements. Subject to the terms of the limited warranty section below, UTC Fire & Security will repair or replace a Product that fails to meet the terms provided, within the Product’s warranty period as set out below. Unless otherwise required by applicable law or agreed between UTC Fire & Security and the purchaser of the Product, the warranty period varies based on Product category and type of equipment, as set forth in table 1 on page 2 of this Policy. The warranty period starts from the actual Product manufacturing date. To cover for the average time between manufacturing and delivery of the Products, 6 months will be added to the published warranty period. UTC Fire & Security will return Products to you via our standard shipping method. UTC Fire & Security will provide a new product in case a product fails new out of the box within 90 days after invoice day, by issuing a credit note after receipt of the non-performing product. All such FFN non-performing products shall be returned to UTC at the latest within 30 days after RMA receipt. A copy of the original invoice and a clear fault description are required to request RMA and a FFN replacement. All Products shall be returned to us with all accessories supplied and in its original state and packaging, incomplete Products will not be accepted. For any and all FFN Product returns, please contact your local UTC customer service. For all out of warranty repairs, UTC Fire & Security will provide a Product repair price estimate quotation. Please contact UTC local customer service for repair price quotation. Out of warranty repairs are granted a warranty term of 12 months from the repair date. UTC Fire & Security Product(s) repair price estimate quotation contains an approximate cost to repair the damage in the Products, however in case an unforeseeable, unnoticed or hidden damage is discovered only after commencement of the repair work then the repair costs of such damage will be invoiced separately. Due to these reasons, our estimate or quote is a preliminary estimate only and not a contract to repair the Products for the estimated price and does not cover any additional parts or labor which may be required after the repair work has been started. Therefore our repair prices are not guaranteed and the quotations may be subject to change. You will be notified if any additional repair costs arise in the repair process and any such additional costs will be subject to your prior approval. If you disagree with such additional repair costs, please provide a written notice of disagreement to UTC Fire & Security BV. For Products that are not mentioned in the below-mentioned Product warranty periods, contact UTC local customer service. UTC reserves the right to replace such product if the repair – in UTC’s opinion – is not feasible. UTC Fire & Security reserves the right not to proceed with the repair work and will return unrepaired or partially repaired Products and will only invoice you for the part of work already performed prior to receipt of your notice of disagreement. RMA requests for unused stock returns (i.e. new, unused standard Production items in original unopened shipping carton and packaging, in its original state must be made not later than 90 days after the invoice date. Any such request will be subject to a Product specific case-by-case approval process by UTC Fire & Security and any approved request will be subject to the application a 15% handling fee, the corresponding amount of the handling fee will be deducted by UTC Fire &Security from the value of the unused stock returns. Any credit note granted for stock returns by UTC shall be used for the purchase of new Products within one year of the date of issue of such credit note. Note: Stock returns are not accepted for special ordered and customized Products, customized kits, software or batteries. 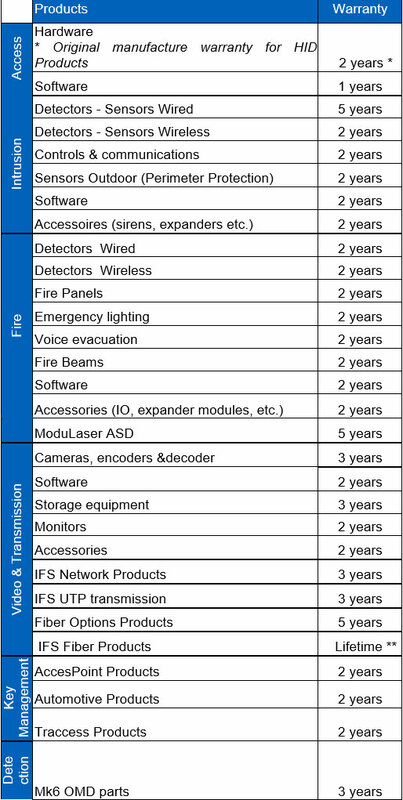 Table 1 lists warranty periods for most of UTC Fire & Security Products, sorted by category, and are further subject to terms and conditions of any possible ‘end of life’ notices. Warranty period commence as set forth under the heading ‘Warranty repair/replacements’ . ** Lifetime warranty definition: during the lifetime of the Product till Product end-of-life (EOL) announcement, but with a minimum 5 years. UTC Fire & Security warrants that its Products are free from defects in workmanship and materials, and will be in accordance with UTC Fire & Security’s standard specifications, subject to the terms of this limited warranty. With respect to any Product furnished by UTC Fire & Security, the foregoing shall apply only to meet said warranty that appear within the applicable warranty period set forth in this Policy. The warranty is given only to the original purchaser and does not extend to any other party. UTC Fire & Security is not responsible for conditions or applications over which UTC Fire & Security has no control. Defects or problems as a result of such conditions or applications are not the responsibility of UTC Fire & Security. Such conditions include normal wear and tear; catastrophe; fault or negligence of any user or any party other than UTC Fire & Security; improper installation, application, storage, maintenance, or use of Products; other causes external to Products; or failure to conform to any applicable recommendations of UTC Fire & Security. . To the extent that any Product includes firmware, whether included in a Product furnished hereunder or provided separately, UTC Fire & Security warrants that such firmware will, at the time of delivery by UTC Fire & Security and for a period of 90 days thereafter, conform in all material respects to UTC Fire & Security documentation relating to such firmware. For non-rechargeable battery UTC Fire &Security grants “ Faulty from new” warranty as set out above, and for rechargeable battery, one-year limited warranty is granted solely in case of manufacturing failure. If any Product fails to meet the Limited Warranty, UTC Fire & Security shall, at its option, correct any such failure by repairing any defect or damaged parts of damaged Products, or make available, CPT shipping point, any necessary repaired or replacement parts. UTC Fire & Security reserves the right to replace any Product under warranty with new or remanufactured Product. UTC Fire & Security will not be responsible for any costs (including labor cost) associated with the removal or reinstallation of Products incurred by the original purchaser or any other party. The repaired or replaced Products will be warranted under the terms of the Limited Warranty for the balance of the term of the warranty or for 12 months, whichever is longer. For any warranty claim, purchaser / buyer should contact UTC local customer service and request authorization to return the Product. The preceding subsections of this Limited Warranty set forth the exclusive remedies for claims based on any defect, failure, malfunction, or any other performance or nonperformance of any Product, whether the claim is in contract, indemnity, warranty, tort (including negligence), and strict liability or otherwise, and however instituted. Upon expiration of the applicable Limited Warranty period, any liability of UTC Fire & Security in connection with such exclusive remedies shall terminate, and purchaser / buyer shall have 30 days after the warranty period to give written notice of any defects, failures, malfunctions, or other performance or nonperformance issue that appeared during the warranty period. In no event shall UTC Fire & Security be liable for incidental, indirect, special or any other consequential damages. To the fullest extent permissible by law, the foregoing limited warranty is exclusive and in lieu of all other warranties, whether written, oral, implied or statutory. Subject to applicable law, in no event shall the liability of UTC Fire & Security exceed the purchase price of the Products. NO IMPLIED WARRANTY OF MERCHANTABILITY OR FITNESS FOR PARTICULAR PURPOSE SHALL APPLY.